Advantages: Varied and interesting subjects; superb colour registration; thin carrier film; national markings for all aircraft, comprehensive full colour views of each option. Conclusion: A quality product which allows the modeller to choose a scheme other than that found in the kit. 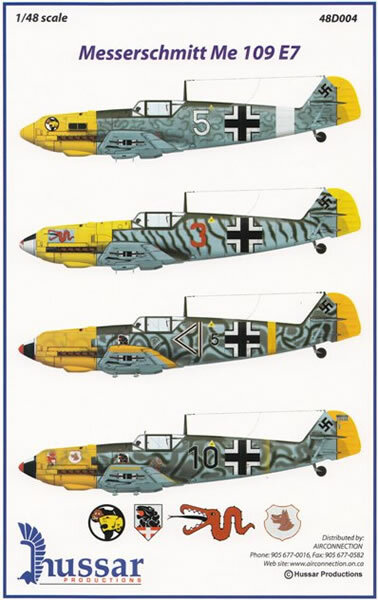 The Messerschmitt Bf 109E has always been a colourful subject. So these 3 offerings should prove popular with modellers. Four options are supplied on each 8.5” x 11” decal sheet and this is accompanied by a page of instructions. Each aircraft is presented with full colour upper, lower, and side views which show precisely where everything should go. The printing is first class with no registration problems whatsoever. The chosen colours on my example were excellent and the density appears sufficient to not allow any bleeding through of the base camouflage. Although this aircraft is not attributed to any particular pilot, the style of “5” is perfect for the mount of Ofw. Albert Espenlaub. 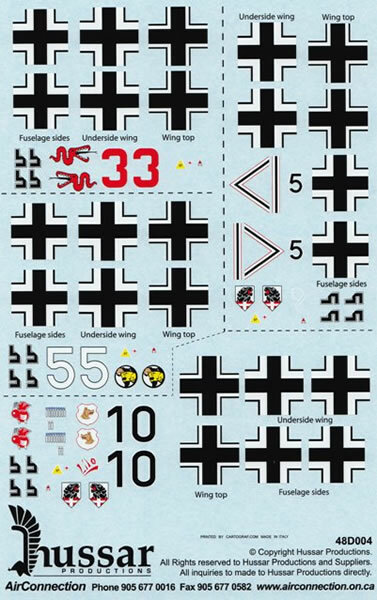 The “scribble” pattern on the fuselage sides as depicted in the instructions also mimics that seen on his North African “Emil”. Espenlaub scored 14 victories before being made a POW on 13 December 1941. Sadly he was shot dead trying to escape just over two months later. Here we have a lovely example of a JG 3 aircraft which was photographed during its transfer from I/JG3 to III/JG51. It proudly displays its “Winged Dragon” emblem which is in the Staffel colour of red and this shade has also been used, along with white, to segment the spinner tip. The curved boundaries of the latter are unusual, as is the striped scheme seen on the fuselage sides. It appears the new owner was going to be Fw. Werner Bielefeldt, a pilot of 7/JG 51, as he is often seen photographed in front of it. One of the most well known JG54 aircraft is that of Lt. Heindl. It was a well travelled machine and survived to take part in the Russian campaign. It is depicted here with the extra yellow trim that was added to the wing tips and trailing edges as well as the additional band around the fuselage. This aircraft was formally with JG54 as clearly seen by the camouflage scheme instigated by that unit in the latter part of 1940. The other giveaway of course is the “Lion of Aspern” badge under the windscreen which shows her previous affiliation with II./JG54. The Wolf badge was applied after her arrival to III./JG 77 and although usually black, colour photographs show this to be more of a tan colour. Fortunately this is how Hussar Productions have reproduced it. Messerschmitt Bf 109 E-4, III.JG77 (ex II./JG54), May 1941, Greece. Another ex JG54 machine that found its way to III./JG77 was “white 11”. It too retains the II./JG 54 badge from its former service. The camouflage is consistent with its Battle of Britain days although the colour images of this aircraft suggest that the usual RLM 02 infill has been changed to that of a darker colour. Although there are victory markings on the rudder, the pilot is unknown. Messerschmitt Bf 109 E-4, I./JG 51, early August 1940, Northern France. The typical RLM 71/02 camouflage adorns the upper surfaces of this machine with a combination of colours forming the fuselage mottle. Although yellow is seen on the wing tips and rudder, photographs of this aircraft point to the nose section being finished in the rarely used white recognition marking. Bulgarian “Emils” were delivered in the standard Luftwaffe colours of the day, in this case RLM71/RLM02 uppersurfaces with RLM65 lowersurfaces. The spinner is RLM70 and yellow has been added to the nose, fuselage and rudder. Messerschmitt Bf 109 E-3, W.Nr. 2643, G5V E52V ARR, flown by Sublocotenent aviator Ion Galea, Mamaia-Cernavoda-Constanta, late 1943. 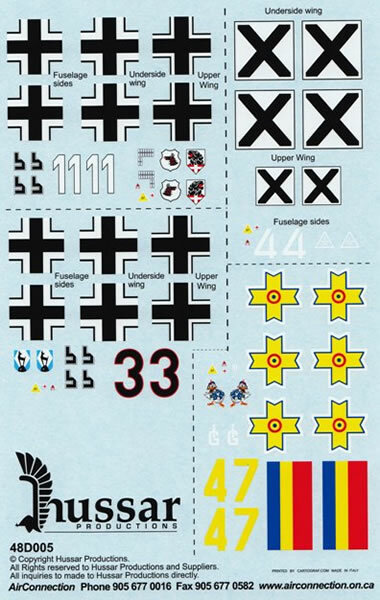 Although finished in the standard export colours of RLM71 uppersurfaces over RLM65 undersides, the original Luftwaffe camouflage still shows through in places. Also seen is the white “IG” monogram painted on the engine cowl, “Donald Duck” badge on the fuselage side, and three victory bars on the fin. 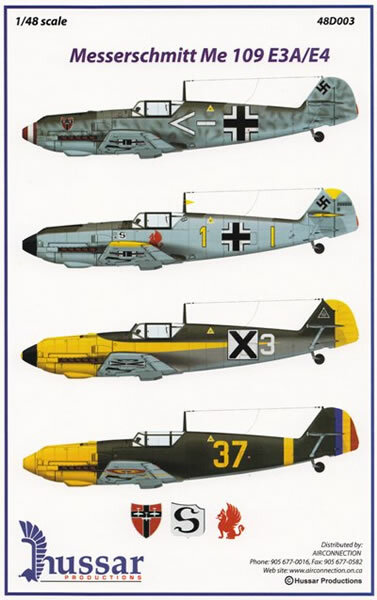 Messerschmitt Bf 109 E-4, flown by Oblt. Albrecht Drehs, Stab III./JG54. On 12 August Drehs was forced to land in a field at Hengrove which is near Margate, Kent. His aircraft displays a white chevron and bar, both outlined in black, and the distinctive III. Gruppe emblem on the upper cowl. This emblem consisted of three white aircraft silhouetted against a black and red “Jesau” cross. This is what his aircraft looked like around mid August 1940. It has the high demarcation finish of 02/71 with the tips of the wings, tailplane and rudder, all finished in yellow. 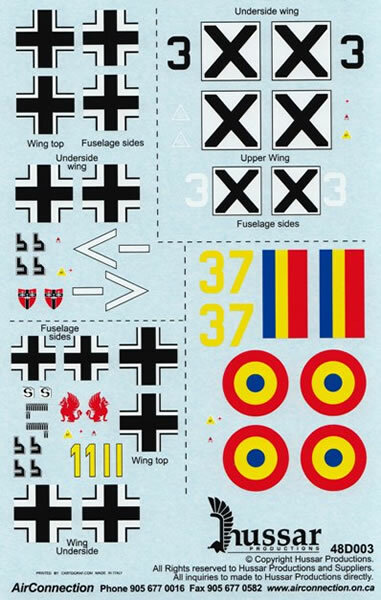 The antenna mast also carries this colour in the form of a pennant, and the Hollenhund emblem of 9./JG 26 can be seen in red behind the JG 2 “Schlageter” shield. Schöpfel used this machine to shoot down 4 Hurricanes of 501 Sqn. in the early afternoon on the 18th of this month. 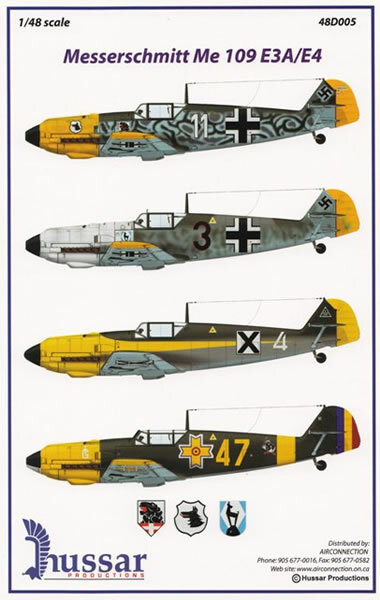 The thin layer of RLM71 does not completely hide the previous owner’s colour scheme and even allows the Luftwaffe’s national markings to show through on the upper wings. The fuselage carries the Squadron Leaders yellow fuselage band and this colour also covers the cowling and surrounds the wings. The cockades are found in 4 positions with the tricolour stripe covering the rudder. The choice of subjects is perfect for those wanting intricate schemes on their aircraft, and yet there are also a couple that allow the more conservative modellers to demonstrate their skills. The quality of the product is unquestioned and the number of items on the sheet will allow something of interest for everyone. These products are the ideal way to dress your “Emil” in a livery that will stand out from the crowd.